This is a puzzle cache. The listed coordinates are not to the cache; they are to the center of San Francisco Bay. In the spirit of the original California Delorme Challenge by Haicoole – and with the release of the NEW California Atlas & Gazetteer that covers the entire state of California, I throw down the gauntlet of the Golden State DeLorme Challenge. This cache is for the seriously addicted! It will require many hours of planes, trains and automobiles (and maybe a boat or two). It will show you the entire state of California and many the many wonders that this great state offers. It may try your patience and will likely challenge your resolve. By the time you complete “The Challenge”; you will have traveled all over the state, probably spent your family inheritance on gas, and said more than a few unkind words about me for setting this up. 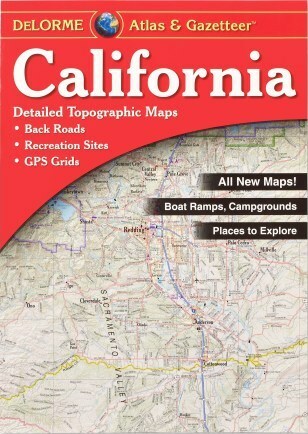 The DeLorme Company has just printed a NEW mapbook that covers ALL of California. The goal of this cache is simple (HaHaHa!!!) – Find one cache on each and every page (within the blue border area) of the California Atlas & Gazetteer. The final cache coordinates can be obtained by successfully finding a cache in each page of the Atlas. In order to complete this cache, you must send me a file containing the list of caches, one per DeLorme Book page, of all of your finds. (.GPX is highly preferred, although .LOC format is acceptable). Once I receive the file, I will review and verify the list and when everything checks out, I will then send you the key to the final cache! The find cannot be logged until the physical container is found and the logbook inside signed. ° The posted coordinates are not the actual coordinates for the cache. The actual cache is somewhere in Northern California. ° Generally accepted rules, guidelines and conditions for logging cache find apply. These must be bona fide caches listed on Geocaching.com that you have personally (physically) found and logged. Caches found for either of the other two California DeLorme challenges may NOT be counted for this one. ° The only caches that count are Traditional, Virtual, Webcam, Letterbox, & Earthcaches. Event/CITO caches (including GPS Adventures Maze Exhibits), Locationless, Multi, Whereigo & Mystery/Puzzle caches do NOT count. ° Placing a cache on a DeLorme Atlas page does not count as FINDING a cache. Caches found and logged online prior to the publication of this cache DO count towards pages found. ° If a DeLorme Atlas page includes area not located in California, only caches in the California portion count. The page boundary is determinded by the BLUE line around the edge of the map. I will go off of the posted coordinates for a cache when determining in which state or page a given cache falls. Offshore/underwater caches will count for the page they are located on. - If a page covers two different areas (such as Pg 69, 99 & 148) you only need to find ONE cache per page. Exception being Pg 139 which includes Catalina Island – you MUST find a cache on the mainland AND Catalina Island. - Pages 136 & 137: These Channel Islands are all either Military or National Park land. Although there are Earthcaches or Virtual caches here, these pages are exempt. You do get extra credit for any of the Channel Island where you log a cache. ° CHANGE!!! - Pages 20 & 21, which cover Yosemite Park are OPTIONAL since they are coverd by Pgs 76 & 77. ° You may have others with you when you find the final only those who have completed the “Challenge” will be allowed to log it as a find. Other logs WILL be deleted. ° Geocaching is supposed to be fun. If you have a question – please ask & discuss it but the final decision rests with the cache owner. A huge thank you to Haicoole and Moose Mob for the inspiration for this cache!